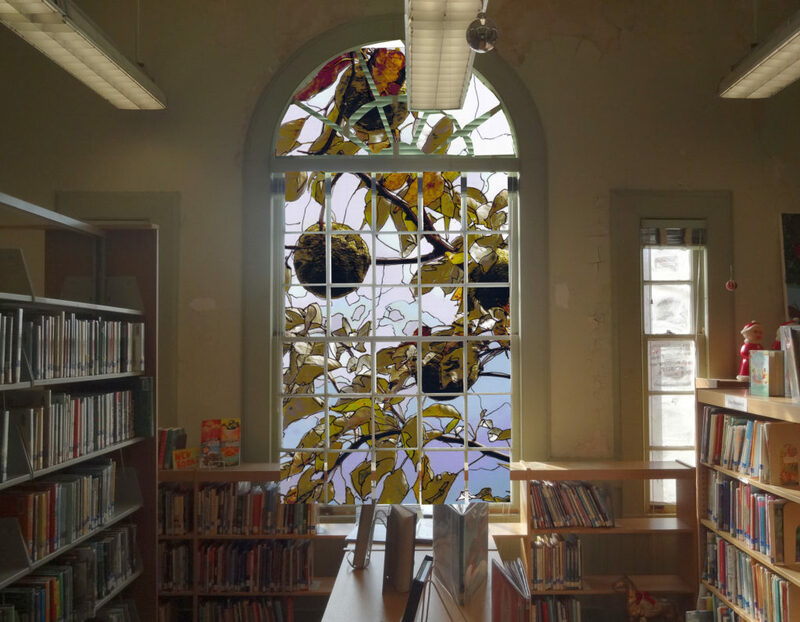 The historic Commerce Public Library will have a new addition in 2018: a colorful fused-glass window by local artist David Zvanut. Zvanut’s glass artwork design featuring the bois d’arc tree — an iconic species in the Commerce area — will be funded by Hunt County Public Art. “The city of Commerce has had a special relationship with the bois d’arc tree since its founding. It has been proclaimed the ‘Bois d’Arc Capital of Texas’ by the state legislature, and I think it’s only fitting to showcase our most iconic local tree in our most historic downtown building,” Zvanut said. The countryside near Commerce is dotted with bois d’arc trees, and many Commerce-area homes are built on bois d’arc stumps. “There are miles of barbed-wire fences held up with old bois d’arc posts,” he said. Those posts served as inspiration and material for his previous Hunt County Public Art project, “Eternal Carousel,” a massive sculpture installed in the Commerce City Park three years ago. For the library, perhaps the most recognizable and architecturally significant structure in downtown Commerce, preserving and not altering its historic structure was part of the artist’s plan from the outset. A portion of the budget for this project will be available to restore the existing historic window. The glass artwork will be installed using guidelines from the Texas Historical Commission that will prevent it from permanently changing the window’s historic wood frame, preserving it for future generations. The tradition of decorative glass windows in public buildings goes back centuries, so the media used to create the art is a good fit historically, Zvanut said. Zvanut earned a master’s degree in fine art from East Texas State University, now known as Texas A&M University-Commerce, in 1986. Friends of the Commerce Public Library have given their formal endorsement, and they are very pleased and honored that the library was chosen for this project. The Commerce City Council voted to move forward with the project at their regular meeting on Jan. 16. People who want to support the artwork installation at the Commerce library, along with a large mural at L.P. Waters Early Childhood Center in Greenville, can do so at the Hearts for the Arts Gala fund-raiser on Feb. 10 at the Emerald Ballroom in downtown Greenville. Gala tickets are available for $50 at HuntCountyPublicArt.com, or $60 the day of the event. Tickets are also available at the Greenville Chamber of Commerce, Landon Winery, Alliance Bank main branch in Greenville and the Magnuson Hotel in Commerce.